US 401: Appeared in late 1926 or late 1927 as an early US Highway although it is not clear where it initially ran. Some maps show US 401 entered Virginia at Soudan and proceeded to Clarksville via SR 822, which ends at Buggs Island Lake and US 401 would've continued north. Driveable road picks up again with SR 821 Old National Hwy at the Merifield Wildlife Management Area. Alas, SR 821 ends at another arm of the lake. US 401 picked up SR 1102 5th St on the other side into Clarksville. This was an add-on to VA 32. Some maps say that US 15 initially was on the road to Clarksville and some even show US 15 east to South Hill. Interestingly, an official map I'm certain is from 1927 shows no US 401 at all, while a late 1927/early 1928 official map shows Clarksville to South Hill as US 401. US 15 Clarksville to South Hill? No US route at all Clarksville to South Hill? What is more certain is that eventually US 401 did head east with VA 201 via today's US 58 Business and US 58 east of Clarksville; SR 783 through Finchley; SR 756 into Boydton; one block of SR 707 north. US 401 then followed VA 12 where it followed US 58 Business east to about the mainline US 58. VA 12 initially followed a road now abandoned save a small piece of SR 608 Ridge Rd that follwed the RR tracks closely (north side) until about the current US 58-VA 4 jct. 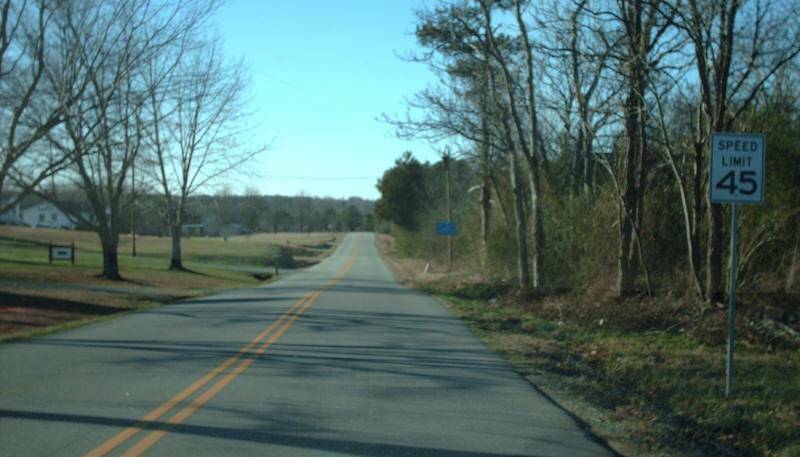 VA 12 followed "Old Plank Rd" from here which is now SR 674 to Baskerville; SR 669 to SR 668 to SR 663 to SR 645 to SR 644 to SR 661 Lombardy Grove; SR 661 to South Hill. US 401 ended at today's Goode Ferry Rd (SR 903), which at that time was US 1/VA 31. In 1927, US 1 was moved off SR 903 and instead onto its current routing. The 1931 route log says US 401 still ended at South Hill so US 401 may have still ended at Goodes Ferry Rd or may have been extended east slightly to current VA 47. 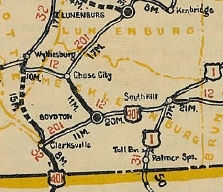 In 1930, US 401 was placed on modern US 58/US 58 Business from Boydton to Lombary Grove, leaving behind several CRs: 223A, 262, 205A, 8, 130, 5, 105, and 12. Also by March 1930, US 401 was extended west over VA 44 from Clarksville to end at US 501/VA 18 South Boston. US 401 used used US 58 Business to 8th St to SR 750 west to US 58. US 401 then appears to have followed SR 722 Cow Rd, SR 732 Buffalo Creek Rd over to Buffalo Springs, then SR 601 through Midway to Omega, then US 58, SR 742 and US 58 before ending at US 501. 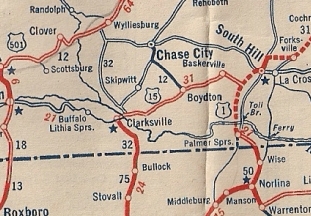 In 1931, US 401 was moved to US 58's routing from South Boston to today's SR 750 west of Clarksville. In 1932, US 401 was renumbered as part of US 58.